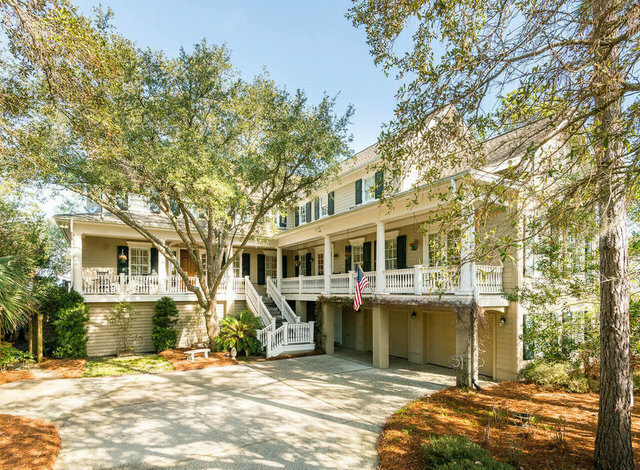 Designed in the style of a Charleston single family home, this stunning four-bedroom, three-and-a-half bathroom home at 173 Marsh Island Drive offers a gracious exterior with an expansive columned front porch, traditional shutters, and gas lanterns. Quality construction includes a raised foundation with HardiPlank® siding, exquisite finishes and accents throughout, and ipe decking–all designed with the marsh and river views as the focal point for this relaxed island getaway. The residence is situated on a quiet street within an established neighborhood near the Beach Club, its oceanfront amenities, and the famed Ocean Course. From the home’s outdoor living spaces, total privacy is relished as there are no other homes or properties within site across the panoramic Lowcountry views. Inside, the great room is classic in its design with beautifully coffered ceilings and crown molding, golden oak hardwood floors, and a wood burning fireplace with LP gas option and a slate surround. Built-in cabinets on either side conceal an elaborate entertainment system, and wall-to-wall windows and clerestory highlight the majestic marsh views beyond. They also allow bright, natural light to flow inside. Twin French doors in the living room open to the ipe deck and adjacent wood-paneled screened porch. Sweeping marsh vistas extend all the way to the Kiawah River from these outdoor spaces where family and friends can come together, breathe in the coastal air, and enjoy the cool breezes while watching Kiawah’s abundant wildlife take flight across the horizon. In the gourmet kitchen, quality stainless steel appliances and ample seating provide a functional and comfortable space for meal preparation and entertaining. Custom cabinets and granite countertops are combined with a large center island with bar seating, a GE Monogram® gas cooktop, double ovens, refrigerator and freezer, microwave, warming drawer, and elevated Bosch® dishwasher. A passthrough from the bar area, complete with a sink and wine cooler, and a casual dining area with a bay window open the kitchen to the living room. The formal dining room is just off the kitchen and boasts wainscoting, large picture windows, a medallion accent, and marsh views. A guest suite completes the first floor and has hardwood floors, a walk-in closet, glass French doors to the front porch, and a full bathroom with wainscoting, a soaking tub, and a marble vanity. Upstairs, an office with built-in wood cabinets, shelves, and a desk area could easily be used as a fourth bedroom. The space also shares a full bathroom with the neighboring guest room, which is generous in size and offers unending views. A coffee bar with refrigerator serves the upstairs. The spacious master suite with a walk-in closet has its own private deck overlooking the exquisite Lowcountry marsh and a lavish bathroom complete with a granite vanity, his-and-her sinks, ceramic tile floors and accents, a Jacuzzi® tub, glass-enclosed walk in shower, and separate water closets. 173 Marsh Island Drive features many of the bells and whistles desired in today’s modern homes including an elevator from the garage to the first and second floors, a sound system, Gundfus® hot water system, an irrigation system, landscape and outdoor lighting, outdoor shower off the garage, hurricane-rated doors and windows, and a security system. For owners interested in the full Kiawah experience, a Kiawah Island Club Golf Membership is available. This home is available partially furnished.